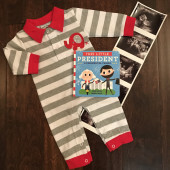 Steve and I are so excited to bring our baby boy into the world! His due date is June 17th. Thank you for sharing this special time with us! We are also registered at Chatters in Bowling Green, KY.